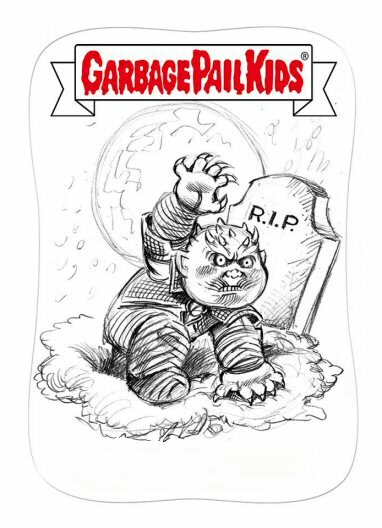 On January 5th, 2018, at the beginning of the New Year, the Topps company started to release another installment of their exclusive online brand of Garbage Pail Kids cards as specialized product. 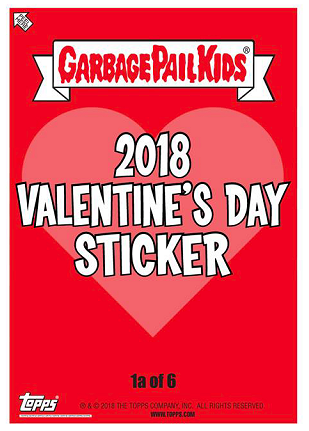 This marks their third consecutive year to offer a slew of unique online material to the masses inbetween their larger retail releases that tends to caters to a much smaller niche of collectors. 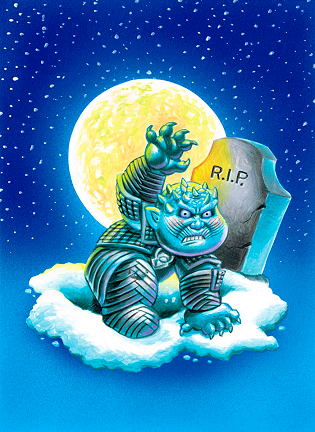 Artist Joe Simko retired from online submissions in 2017, so his work will only be found within the retail releases going forward for the GPK brand. 1. All ideas for the Golden Groan Awards set was conceptualized by the Topps NPD Dept. prior to the week of release, except for the Game of Thrones parody created by artist BRENT Engstrom. The Topps concepts, including his own, were all fleshed out by Engstrom three days prior to the release and the four characters he painted were completed the two days leading up to the Friday release date. The other two tight concepts were originally both supposed to be given to artist David Gross to execute for that same time period, but the Twin Peaks piece was, unfortunately, given to JUNGWHA Im to finish. The set includes tribute pieces to sets OS1, OS2 and OS4. 2. 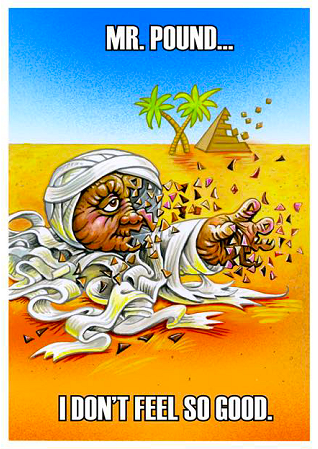 The set includes the first tight-pencil artwork used as the final artwork on card for The Shammys online release with concept and drawing by artist BRENT Engstrom. 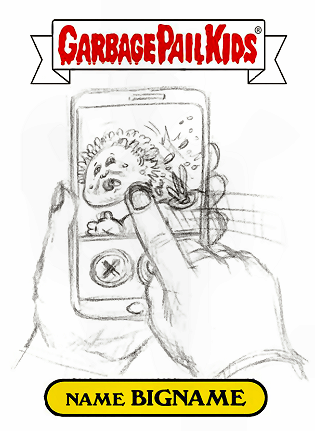 A regular, tight-rough concept was produced for the piece along with a final card mock-up image. The artwork was due the morning of Janaury 26th, but not posted until the 29th, which would've given the aritsts three additional days to complete the artwork, non-rushed. 3. 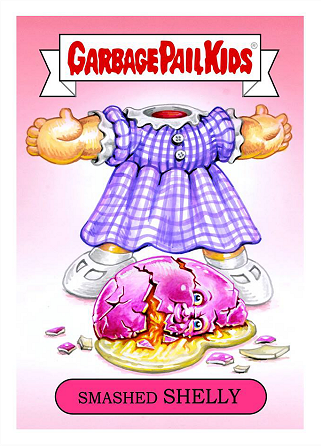 Some big GPK hitters like DAVID Gross and BRENT Engstrom submitted Valentine's Day concepts into Topps too late in the game during the month of February and the entire set had been cohesively completed by artist Miran Kim using tribute pieces for the holiday release. 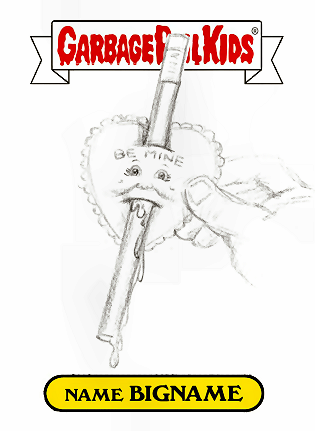 Several of Gross' concepts not found within the set are displayed below for the following subjects and suggested nomenclature: Valentine's Card and pencil prize with the names Valentine's DANA, BEA Mine, Be MINA, KITTY Card and VALENTINA Day, Sweethearts Candy with the names Sour SAL, SANDY Candy and Bite MEL and Tinder App (swipe left) with the names TIM-der, Swipe LEIF and REESE-jected. 4. 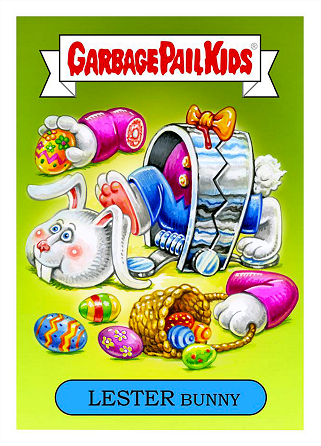 Artist Smokin' JOE completed four of the five GPK characters and Wacky Packages products for the Easter set released the last week in March. 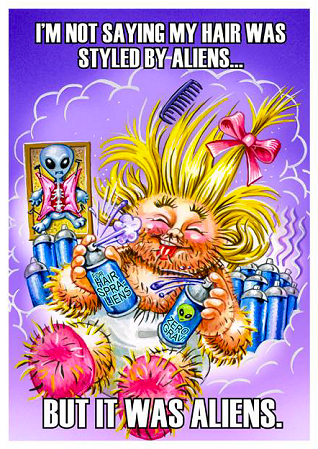 McWilliams had this to say about the timeline: "Wrote gags (11 total Wacky and GPK) on the March 24 and 25 weekend... submitted for that Monday March 26. Received 4 approvals Monday afternoon... with a Thursday 8 am NY time delivery deadline. Painted like crazy until Wednesday night (March 28) and sent in my art scans so they would be waiting in Topps' email Thursday morning. They went Live on the Topps site that same day." 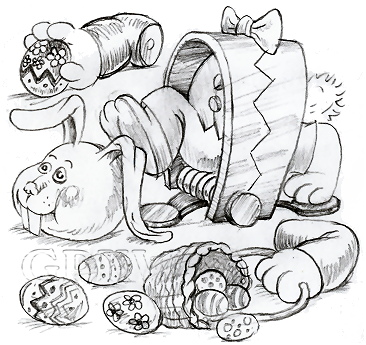 The PAAS-esque bunny has a bit of blood added to the leg jaw-trap as seen in the social media card mock-up image. 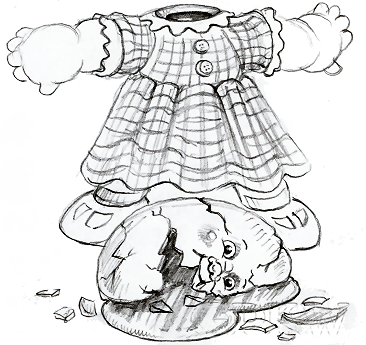 The Leaky LINDSAY-like dress of the Cadbury-esque head character had her hand turned for the final artwork. 5. Topps celebrated the new R&R Hall of Fame inductees by releasing a Hall of Lame parody set in April of 2018. An email went out to all artists the last week in March for concepts to be turned in; Gross responded same-day and five of his concepts were approved, the three he painted were completed on March 29th before the weekend and, due to time restraints, two concepts were given to artist Brent Engstrom to complete which were finished on the 29th and 30th of that month. 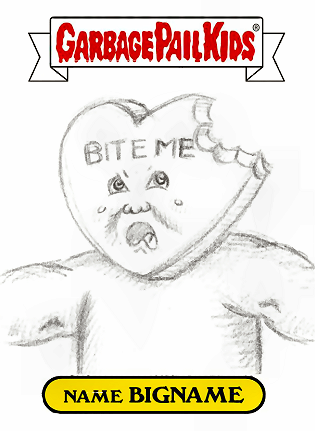 As seen with the card mock-up image by Gross of cards 1a CANDY Oh No! 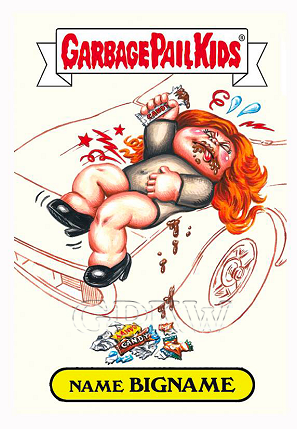 and 1b cramped CARLA who has overindulged, the 'Candy-O' album by The Cars also inspired artist Neil Camera to work on a tribute piece on a blank IDW GPK comic posted to social media on March 31st: "A little weekend GPK project I painted in honor of The Cars finally getting into the Rock and Roll Hall of Fame", where the character dents the hood and flattens the tire. 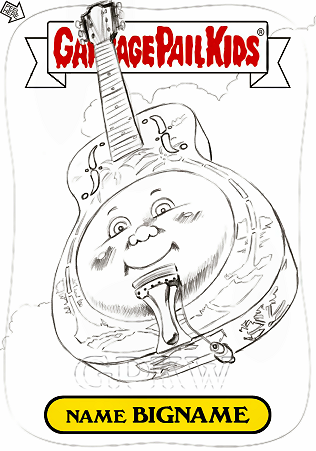 Also pictured is the tight pencil by artist Brent Engstrom for card #2 that shows the neck and headstock of the guitar not hidden by the GPK header; Engstrom extended the vibrato mechanism for the final artwork to humorously go up the character's nostril. The character was advertised with a rare C-name for card 2c Brothers In ARMIE but the card was never issued within the set once printed. 6. 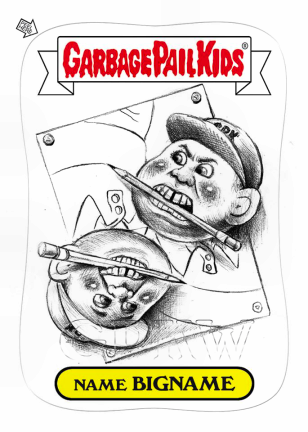 At the end of February, 2018, Topps begain to release their '80th Anniversary Wrapper Art' online, three titles every Tuesday. The third week of April collectors had the opportunity to purchase either a #23 card at $7.99 (SKU: ART-CCKB16-18T80A-023), a small poster at $19.99 (SKU: ART-POSCCKB-18T80A-023), or the $99.99 gold edition 1/1 poster (SKU: ART-POSCCKB-18T80A-023G); all with a wonky re-created header. 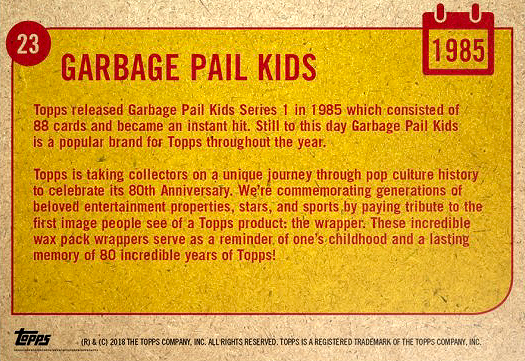 Sales pitch: "This year, Topps is excited to celebrate its 80th Anniversary with exclusive trading cards that takes collectors on a unique journey through history. As we celebrate generations worth of pop culture and sports, we are paying tribute to the first image people see of a product: the wrapper. More than packaging, the wax packs served to advertise the product as it sat on store counters and shelves around the country. The incredible artwork serves as a reminder of ones childhood and a lasting memory of 80 incredible years of Topps!" The anniversary ran until November 20th with a banner stating online 'Final Week', 'Plus Additional Checklist Card!' 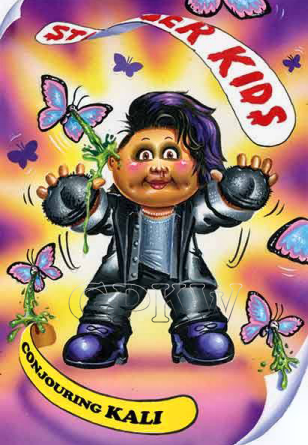 #115 that had the GPK moniker. 7. For the 4th of July card 3a, the nomenclature was spelled 'LIEF Guard' on the website and 'LIEF Gaurd' on the card image, it should actually be spelled 'LEIF Guard'; this was corrected for the printed card. 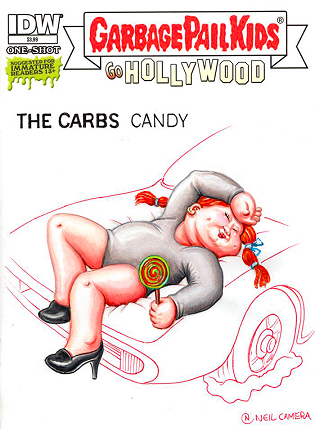 For some unknown reason, all of the artwork was completed by a Wacky Packages artist. 8. The artwork for the Summer Comic Convention set was entirely painted by artist JungHwa Im; however, half of the concepts came from new concepts by Engstrom, Gross and Simko and the other half were based off of OS artwork by John Pound. 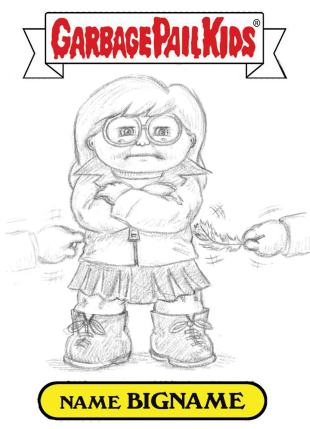 Artist Brent Engstrom suggested the names Supper MARIO (used) and '16 Bit BRENT' ('MIT' used instead) for card #3, and artist David Gross recommended the nomenclature of Dreary DARIA (used), 'Dry DARIA', 'Acerbic ANGELA', and 'MORGAN Dorfer' ('Dorker' used instead) for card #4. 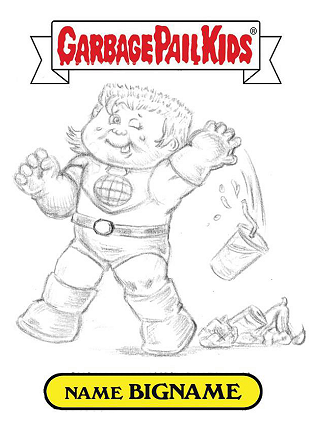 Gross suggested the names CAMERON Planet (used), Earth DAYTON (used) and 'Litter BUD' for card #7, and Engstrom recommended the nomenclature of 'PAT Dog' and 'OWEN Worst Enemy' for card #9. 9. 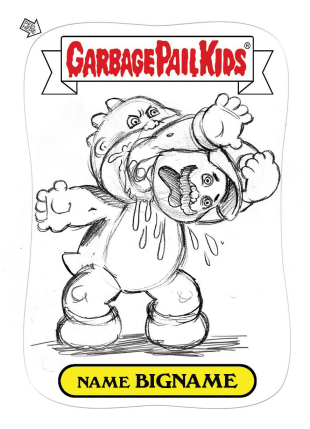 The On-Demand Set #9 GPK Memes, a Topps.com exclusive, like the last online Wacky Packages release, contained parallel chase cards to collect. The set configuration included the ten A-names, the ten B-names and five parallel chase cards per set for a total of twenty-five cards; one C-name, one pink parallel and three green parallel cards. There was also the possibility of scoring a twenty-six card set with a 1:2 chance of pulling a sketch insert card per set. 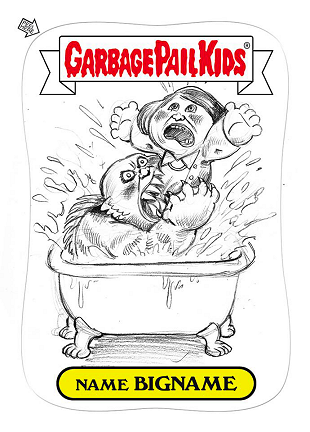 Note: the sketch card stock is the same as the Oh, the Horror-ible! release. The Slimy SAM character portraying the 'Dark Kermit' meme was initially supposed to have New Wave DAVE under the hood, but artist Brent Engstrom changed it to the OS1 lizard character since it was more amphibian-like. 10. 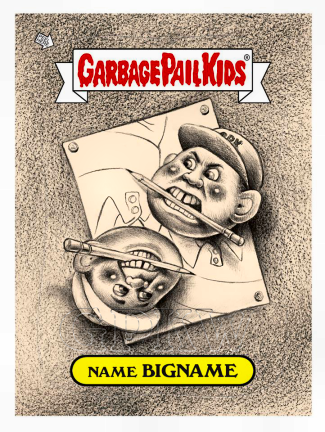 The GPK Memes set was conceptualized by Francis Miceli of Topps who handles The Topps Vault sales, previously handled by Mike Jaspersen. Artist David Gross suggested having an actual meme card without the need of nomenclature which would get the idea across to collectors better; having an A-name card and a B-meme card. 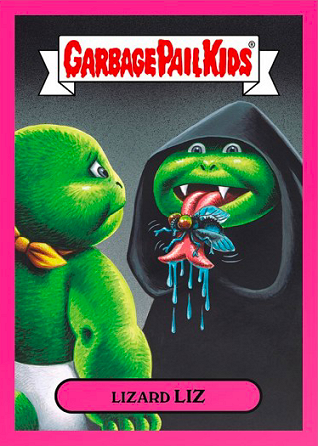 This would have been more reminiscent of the Giant GPK Series of yesteryears, however, Topps decided to stick with the A and B-name cards and create a possible C-meme card for the much-needed explanation of the subject matter, but it eventually became a C-name chase card with suggestive nomenclature only. 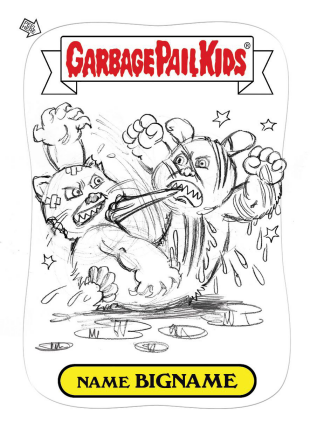 Artist Smokin' Joe McWilliams also made a few card mock-ups to help explain the parody meme. 11. 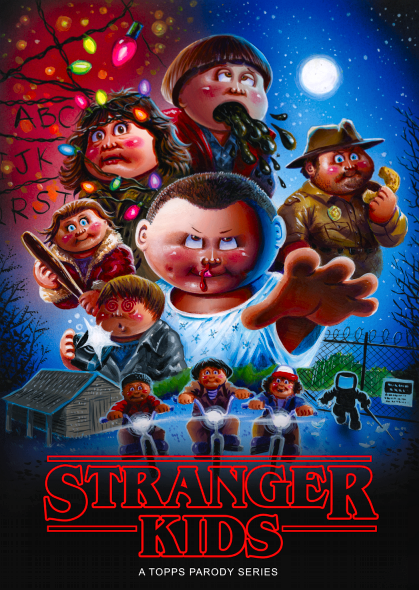 With their license for Stranger Things, Topps received approval from Netflix to create a Stranger Kids GPK parody set to release at the New York Comic Con from October 4th through the 7th, 2018. The release, containing twenty cards from the A-name set and twenty cards from the B-name set, was also sold online through their website. The entire set was painted by artist Joe Simko who autographed cards at the NYCC on Saturday, October 6th. The A-name and B-name sets contained twenty different images for a total of 40 cards for the base card release. The NYCC also contained four exclusive cards, three Upside Down cards; three images from the base set cleverly turned upside down with a blue tint and slapped with a C-name and different nameplate color, and the title/poster card. Only one exclusive card per combo set could be obtained per purchase; a collector would need to spend $160 at the show to complete the entire set. The four exclusive cards were not available via online sales. A poster ad for the release was shared to their social media channels on October 1st, 2018 to promote the release. 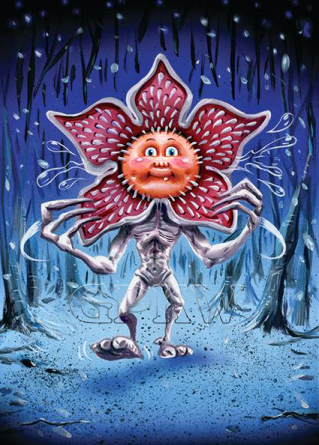 Artist Joe Simko re-watched seasons 1 and 2 of Stranger Things on Neflix prior to starting the project. 12. 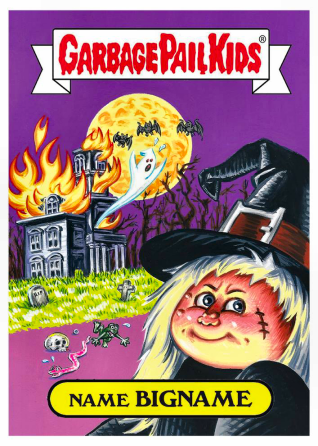 Fun Factoids : The hallucinating cards #8 were not supposed to have a logo or nameplate since there was one already painted onto the final artwork; Simko mock-up. The original tight pencil mock-up cards had a curved 'STRANGER KIDS' header that was switched to the banner-style header at the last minute before printing. Had the Matthew Modine concept not been approved due to image rights via Netflix an alternate 'DOUBLE DUFFER' concept was on standby, the OS2 tribute piece remains unpublished due to a delayed approval process; however, an unknown number of printed cards were handed out the first day of the NYCC and are extremely rare. 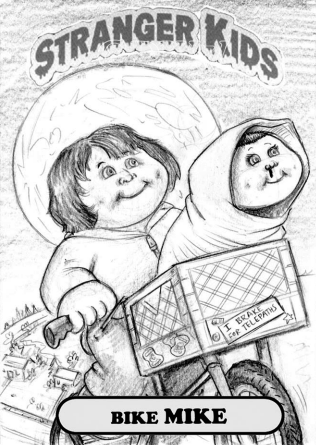 Other tribute pieces include a scene from the E.T. movie, Hopper and a chain smoking OS1 characer by Pound, skateboarder 15a MAX Splat ('MADRID' on the skate deck is the skateboard company that creates official Stranger Things boards) that's an OS3 concept of PAT Splat by Tom Bunk, and card 13a Bye Bye BARB having the same milk carton as 2018S1 '80s History subset card 7a Milk CARLTON by Simko; pulled from the GPK Classic set, et cetera. The character nomenclature for cards Hallucinate EIGHT and Breakfast At ELEVEN match their corresponding card numbers, 8 and 11, respectively; Simko's idea, and the first unlucky victim received the unlucky 13 card number; idea by Topps. The original Demogorgon card image was much simpler in surroundings; Simko was asked to add Dungeon and Dragons artifacts into the piece. 13. 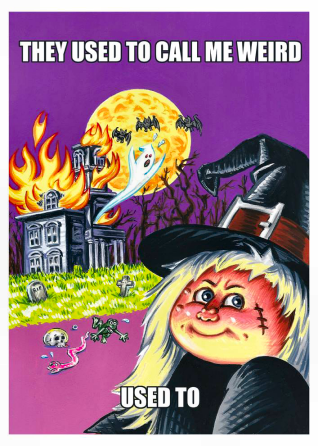 Topps employees COLIN Walton was the editor, Art Director and writer for the retail and online releases and MARK Von Ohlen is the brand manager for the entertainment products through the online 'Summer Comic Convention' set and the 'Oh, the Horror-ible!' retail set, respectively. Art direction changed hands by the third quarter.